Departure Point: Paris with roundtrip transportation, Bayeux, Caen, Le H avre, Honfleur. Other departure points available. NOTE: You may also arrive Caen from Paris via train. Train back to Paris. Inquire. 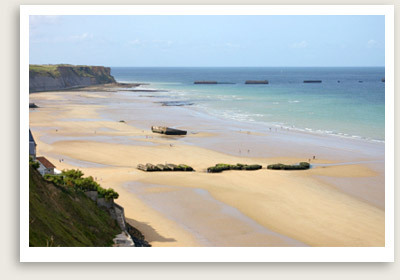 Our Private Normandy Tour of Caen, Omaha Beach, American Cemetery, Pointe Du Hoc Includes: Private Normandy tour guide, transportation, entrance fees, taxes, toll and parking. This fascinating Normandy tour features some of the most important D-Day sites, beginning with a tour of Caen. Though Caen was heavily damaged during WWII, it still boasts several important landmarks. You will begin your Normandy tour with a visit to the Caen Peace Memorial, which depicts both the devastation of war and the global quest for peace in its many forms. Caen is known for its historical buildings built during the reign of William the Conqueror. You will enjoy a short driving tour of Caen, including its huge medieval fortress, an 11th century castle built by William the Conqueror and the Men’s abbey where William the Conqueror is buried. Time permitting, you will have a stop at the German Cemetery, whose dark gravestones are a stark contrast to the all-white tombstones of the American cemetery. Otherwise, you will go directly to Pointe du Hoc, where Colonel James Rudder and his Rangers accomplished a memorable feat of arms on the cliffs on June 6, 1944. From here, you will visit Omaha Beach, where so many young American soldiers lost their lives. You will have a lunch break here before continuing on to the American Cemetery of Saint Laurent, the final resting place of more than 9,000 U.S. soldiers. You will have a look inside the interpretative visitor’s center here, which provides important context for your visit. Depending on your plan, return to train station or hotel in Bayeux at the end of the tour. If you are with our guide from Paris, you will be driven back to your hotel in Paris at the end of the tour.